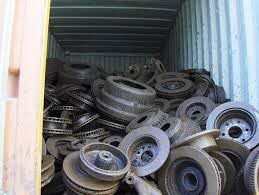 We bring forth an extensive range of Cast Iron Scrap that finds use in vast industrial applications. To be more specific, our Cast Iron Scraps are used for laying foundations. They are widely appreciated for their features like heat-resistance and being corrosion resistant. They are highly pure and durable. We are a reliable Cast Iron Scrap Exporter and Supplier from Thailand. We procure them from trusted sources of the domain. We make them available for buyers in Thailand, Europe and other parts of the world. Contact us for placing orders.